Everyone knows that Nerf make some of the best dart guns around. Everyone also knows that they started with Nerf balls way back in the 60s and 70s, making fun foam balls that you can throw around indoors. But, not everyone is aware that Nerf has it’s own range of melee weapons, too. This largely comes from the increasing popularity of Nerf Wars, in which people set up two or 4 teams and go to battle with each other. Usually, guns are the weapon of choice. But for some people, especially younger kids, it can be extremely fun to swing around a foam melee weapon too. So, for the last few years Nerf have been releasing melee weapons that you can have fun with as well. Though the range of melee weapons isn’t anywhere as near as big as other Nerf products, there’s still a wide enough selection for you to get something that you’d like. Lets have a look at what melee toys that Nerf have released over the past decade. Are Fake Nerf melee weapons worth considering? The Nerf Zombie Strike Series really allows you to have a little fun with melee weapons. 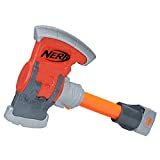 They’re one of the most popular melee weapon ranges released by Nerf, and there’s a small variety of different weapons. Here’s a few of my favorites. The Strikeblade is probably the first place that you want to start if you’re looking for a melee weapon. kids seem to love the stereotypical idea of a sword, and the Strikeblade is a good example of that. It’s around 3 feet long, so just about long enough for your child to swing it around properly. You do need to be careful that you store foam melee weapons properly, otherwise they’re going to end up bent. Apart from that, this is a good first Nerf melee toy. The Chopstock works as an attachment to some Nerf guns. Anything that has the ability to have a stock attached to it, you can easily add the Chopstock on as an attachment. It has a small foam padding at the end of the stock. For me, this is more of a visual accessory than a practical melee weapon for Nerf Wars. But, it does look super cool. The Z Bat is a foam replica baseball that. It’s really soft, and it’s probably one of the best Nerf melee weapons that you can still buy nowadays. It’s designed to try and fit it in with the whole Nerf spooky zombie vibe, and it definitely does a good job of that. The handle is really easy to grip, and it comes with a rope attached so you can store it away easily. Another option from the Zombie Strike Series is the Z Wrench Axe. For battlefield play, it can make a fun melee weapon, though it isn’t particularly long. It’s ideal if you’re wanting to play with younger children, as they’re sure to appreciate the Z Bat and the Z Wrench Axe. You can also hang this one up on the wall easily with the attached rope, so it might be worth trying to collect them all. Nerf Zombie Strike Brainsaw – The Brainsaw is the bigger of the two guns, that has an additional foam chainsaw at the front attached for melee. Nerf Zombie Strike Crosscut – The Crosscut is the better and cheaper of the two options in my opinion. It’s ideal for anyone looking for the typical Nerf pistol with a foam chainsaw melee touch. 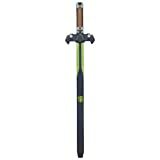 Nerf N Force Swords can be a good melee weapon too. Though they were originally released years and years ago, they’ve managed to keep their popularity. This means that you’re still going to find quite a few of them around, both online and in retail stores. It’s worth bearing in mind that these foam swords do have plastic in the middle, surrounded by a foam outer layer. This means that you’re going to have to ensure that your kids aren’t hitting each other too hard with these melee swords, as it can hurt. To align with Marvel films that have been released over the years, Nerf worked with them to released replicas of the models. Usually, these are remakes of older Nerf guns, like with the Hawkeye remake of the Nerf Bow and Arrow.They’re pretty cool, but each model usually gets discontinued after a few years. So if you want any of them, you should try and pick them up as soon as you can. Most of the Nerf products that are released are melee weapons. But, you’ll definitely struggle to find many shields and ways to defend yourself. 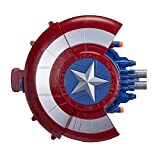 The Blaster Reveal Shield was released alongside Captain America: Civil War back in 2016. It’s not just a shield – you can also fire with it as well, as it has a two dart clip and two extra darts stored behind the shield. The trigger is on the underside of the shield too, si it’s pretty easy to fire. Nerf Wolverine Claws were released towards the end of 2013 to coincide with the Wolverine film that was being released. There are several imitations of these floating about on eBay, so if you do go in search of them, make sure that you get the right ones! There were several different variations of the Thor Hammer that were released in alignment with the Thor films in 2011 and 2014. 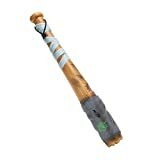 Marvel and Nerf combined in 2011 to released the Thor Armor of Asgard Hammer and the Armor of Asgard Sword. They’re both weapons that Thor uses in the movie, and work well as melee weapons. Later in 2014, they released the Thor Lightning Strike Hammer along with the Thor Battle Hammer. All of these models have been discontinued. Fortunately, Nerf melee weapons aren’t particularly expensive. So, this isn’t a massive concern for the majority of people. One thing that can be an issue however, is the ability to actually get your hands on an actual Nerf toy. Many of them get discontinued, so make sure you’re buying it at an appropriate price. You can find tons of fake melee swords and other toys on Amazon by browsing around. Most of them may not be up to Nerf standards, but they work well as a Christmas present. They’re also usually a little cheaper than Nerf swords, so that’s worth taking into account as well. Overall, there isn’t really one ‘best melee weapon’ like there is with a Nerf gun or a longrange nerf sniper. It does really depend on what it is that you’re looking for. If you’re not sure what your child would like or you can’t decide yourself, then I’d probably recommend starting with the Z Bat or the Strikeblade. They’re both pretty solid melee weapons made to a high standard, so they won’t tear apart after one use. But overall, Nerf melee weapons should just be part of an enjoyable Nerf experience. So pick up a Nerf melee along with your Nerf gun so that you can have some fun with your friends and family.